Look at all these fabulous holiday ornaments that I received this morning. Hannah Nicole from USA came up with the great idea to make a holiday ornament swap. We were 11 ladies from different countries all over the world who joined this swap - such a great and fun idea. Thanks to Hannah for organizing this! 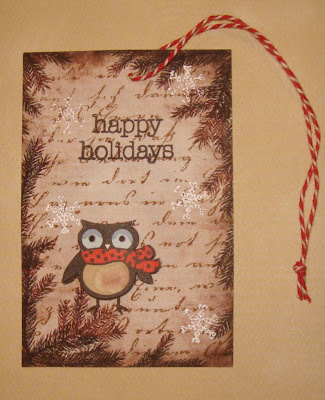 For my holiday ornament I used one of my favourite christmas stamps - the little cute owl from the clear design set "Jolly Christmas" and the beautiful background stamp "Old letter Writing". I colored the owls with Pro Marker pens. 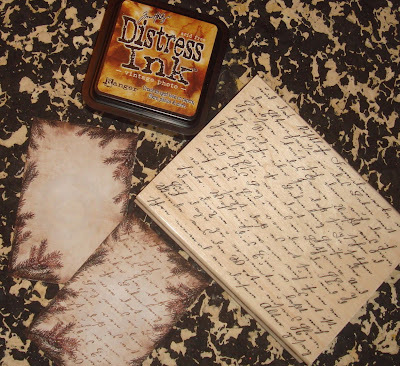 The image with spruce branches is printed out on cardboard and stamped with the background stamp Old letter writing. 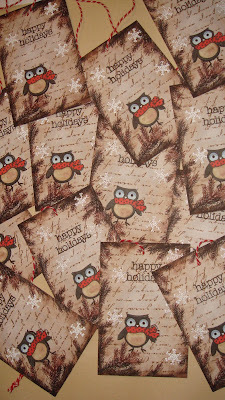 The little snowflakes are embossed on the background with white embossing powder. Voilá - a holiday ornament! Hvor er det en sjov ide at lave swaps med folk i flere lande. Og dit bidrag er rigtig sødt. jeg kan god forstå at du er vild med den ugle. 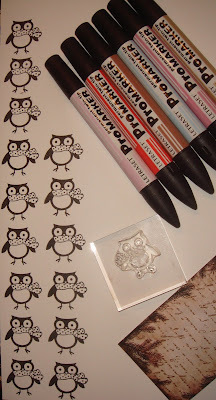 Your owl ornament is sooo cute Sanne! Loved seeing all the other beautiful ornaments you received through Hannah's swap. Hvor er de bare total yndige og de ugler er bare så søde. Wow! What a great ornament swap--genius idea by Hannah! Thanks for sharing your technique with us! You're a whiz with those scissors! Very nicely done, so cute Sanne! LOVE LOVE it!! I've got a new image for you but your email is still not working...let me know that other email once again...I can't seem to find it!! wow! beautiful set of ornaments! 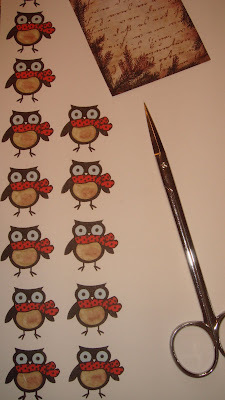 love your cute owl ornament! lovely design! De er helt fantastiske Sanne. Thanks, Sanne, for showing the process for your excellent ornament. It so charming! I have them all arranged on a tiny tree and they look amazing all together. I'm so glad you took part in Hannah's swap, I love having my own little bit of your art!